Alma Mulholland - Heritage Funeral Homes Inc.
Alma passed away peacefully at Groves Memorial Hospital, surrounded by the two people she most loved in the world: her daughter, Judie and her “surrogate-son,” Ray Hutchison on July 2, 2018. She was in her 93rd year, 5 days short of her 94th birthday. She was a long-time survivor of colon cancer, having first been diagnosed in 1976. To the credit of the (local) medical profession, it wasn’t the cancer that got her in the end, but old age. Her body just gave up and no amount of resuscitation or heroic life-saving measures would have changed the outcome. 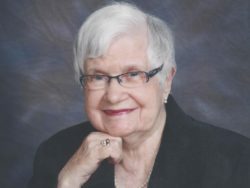 Alma was the beloved wife and soul-mate to the late Lloyd L. Mulholland and she is survived by her son Craig L. Mulholland who currently resides in a nursing home in Windsor, Ontario; her daughter, Judith A. Mulholland who lives and works in Tallahassee, Florida with Keeffee Haynes, her partner; and Ray Hutchison of Arthur. She is also survived by her only living sibling, Clinton (Joe) Courtnay who lives in Buford, Ontario with his wife Yvonne and their three children, Timothy, Tina, and Terry Lynn, their significant others, and several grand-children. He also has two children from a previous marriage, Robert and Deborah, together with their spouses and offspring. Remembered by her late sister’s son, Ronald Frizzle and daughter, Donna Lynn Martin who also live and work in the Buford area, plus her husband Don, and their children, Jeff Bryan and Darcy Lynn Henry together with their families. Fondly remembered by her several nephews, nieces, and cousins on both the Mulholland- and Courtnay-side of the family and the many friends, neighbors, shop-keepers, and care-givers who Alma respected and cherished. Her life was enriched as a result of their thoughtfulness and the many kindnesses shown to her over the years. Family and friends are welcome to join us for a Memorial Service at the Arthur United Church on September 29, 2018 at 11 a.m. The Rev. Diane Eurig of the Arthur United Church will officiate. A private ceremony for the inurnment will take place on October 2, 2018 at the Troy Cemetery, Troy, Ontario. As an expression of sympathy and in lieu of flowers, the family would appreciate donations to the Canadian Cancer Society, the Arthur United Church, or any Charity of your choice.